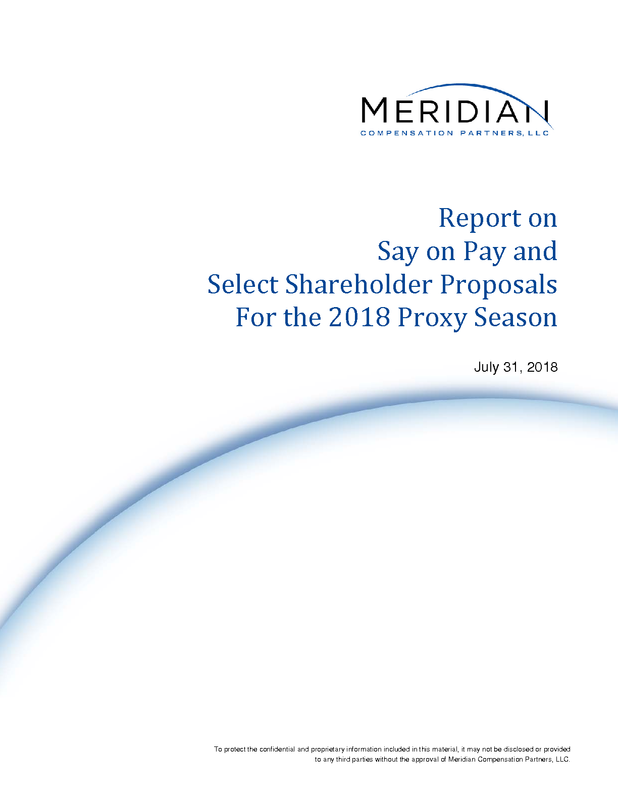 Meridian Compensation Partners, LLC is pleased to provide this periodic report on key voting results for the 2018 proxy season. ■ Analysis of Vote Results on Select Shareholder Proposals. 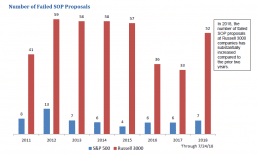 ■ 98.36% of S&P 500 companies’ SOP proposals have received majority shareholder support (7 S&P 500 companies’ SOP proposals failed to receive majority support – namely, Ameriprise Financial, FLEETCOR Technologies, Halliburton, Mattel, Mondelēz, Walt Disney and Wynn Resorts). 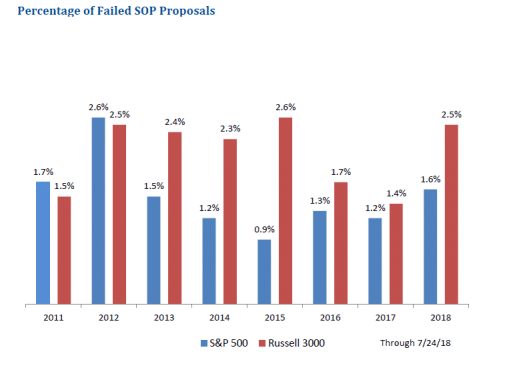 ■ 97.47% of Russell 3000 companies’ SOP proposals have received majority shareholder support (52 Russell 3000 companies’ SOP proposals failed to receive majority support). 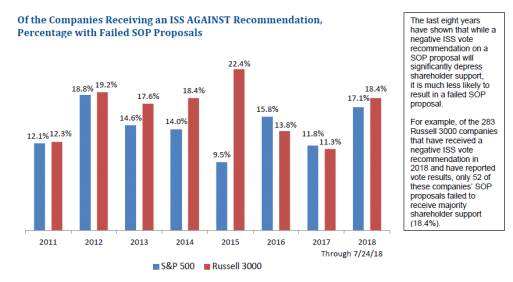 ■ Institutional Shareholder Services (ISS) has recommended AGAINST 9.8% and 13.7% of SOP proposals at S&P 500 companies and Russell 3000 companies, respectively. 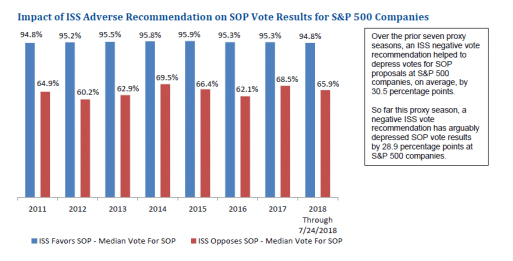 ■ So far this proxy season, negative ISS SOP vote recommendations at S&P 500 companies have arguably depressed shareholder support by 28.9 percentage points, in line with the prior seven-year average of 30.5 percentage points. However, major institutional investors continue to employ their own review models. 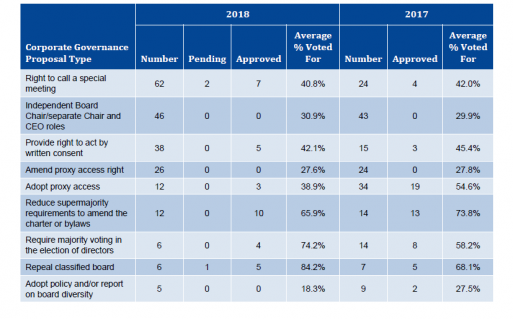 ■ So far this proxy season, the most prevalent shareholder proposal on corporate governance relates to right to call a special meeting at a specified ownership threshold. Of the 60 special meeting proposals voted upon thus far, only 7 have received majority shareholder support. ■ Another prevalent shareholder proposal on corporate governance relates to the separation of CEO and Board Chair roles. However, none of the 46 proposals voted on thus far have received majority support. ■ Other key shareholder proposals on corporate governance seek (i) the right to act by written consent, (ii) the right to proxy access, including proposals to adopt proxy access or amend proxy access bylaws to broaden the proxy access right, and (iii) the elimination of supermajority requirements to amend the charter or bylaws. ■ The most prevalent type of compensation-related shareholder proposal requests that a company’s board include environmental or social metrics in determining senior executive incentive compensation. These proposals often aim to link incentive awards to performance measures related to drug pricing, data privacy, cyber security or sustainability. Other prevalent compensation-related proposals seek for the board to adopt or broaden a company’s clawback policy and report on a company’s gender pay gap. ■ Other compensation-related shareholder proposals continue to decline in prevalence, including proposals to: (i) prohibit vesting of equity awards solely upon a change in control, and (ii) impose stock retention or holding requirements. Shareholders have not approved any of these proposals so far this year. 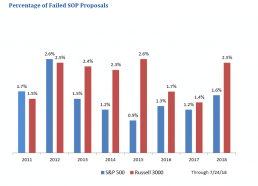 So far this year, 7 S&P 500 company’s SOP proposals and 52 Russell 3000 companies’ SOP proposals have failed to receive majority shareholder support. 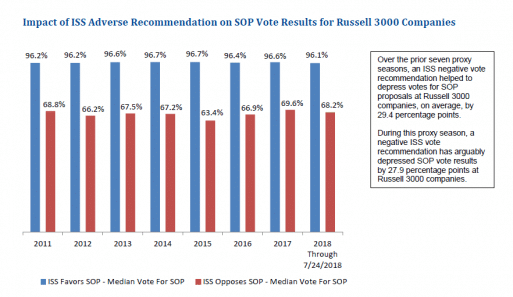 Around 80% of both S&P 500 companies’ and Russell 3000 companies’ SOP proposals have received 90% or more shareholder support through July 24, 2018 (see following discussion). These multi-year trends in high passing rates at both S&P 500 companies and Russell 3000 companies strongly suggest that these companies have been effectively addressing compensation and corporate governance concerns raised by shareholders and proxy advisors. ■ Failure to respond sufficiently to multiple years of low SOP support. ■ CEO pay-for-performance misalignment, primarily due to a failure to meet ISS quantitative tests (especially the three-year Relative Degree of Alignment (RDA) test, which compares three-year relative CEO pay and relative TSR performance, and/or the multiple of peer median test). ■ Goals in short- and/or long-term performance plans not viewed as sufficiently rigorous. ■ Lowering of performance goals from prior year without corresponding decrease in incentive award opportunities. ■ High proportion of non-performance-based compensation. ■ CEO compensation is largely discretionary and/or lacks clear linkage to financial performance criteria. ■ Performance-based equity awards include a one-year measurement period or alternate vesting conditions. ■ Outsized time-based grants to new hires (CEOs and other NEOs). ■ “Problematic pay practices,” including large, one-time equity grants, excessive retirement payments. 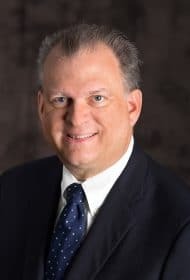 A primary driver for an unfavorable vote recommendation from ISS is CEO pay-for-performance misalignment based on weak outcomes from the ISS quantitative tests, especially the three-year Relative Degree of Alignment (RDA) test. 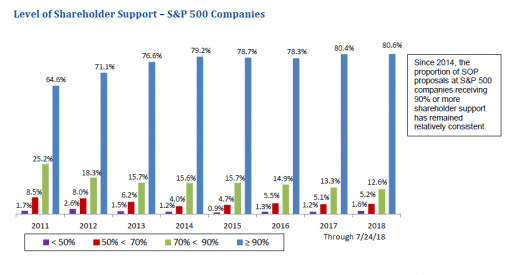 As shown below, in 2018, ISS has issued a “High” concern level for roughly 16% of companies, and 50% of these companies have received a negative ISS vote recommendation. In contrast, only a small minority of companies have received a negative ISS vote recommendation for “Medium”, “Cautionary Low” and “Low” concern levels this year. Companies that receive a “Cautionary Low” or a “Medium” concern on the initial quantitative pay-for-performance tests are subject to ISS’s relative financial performance analysis to determine the overall concern level and the degree of scrutiny in the ISS qualitative pay-for-performance assessment. As an increasing number of large cap companies have voluntarily adopted proxy access, the number of shareholder proposals seeking proxy access this proxy season has seen a substantial decline from 2017 levels. Similar to last year, shareholders are also voting on proposals to amend proxy access bylaws to include provisions that broaden the right to proxy access. However, none of the 26 proposals voted on thus far have received majority support. The following table shows 2017 vote results and 2018 vote results through June 6, 2018 on proxy access proposals. 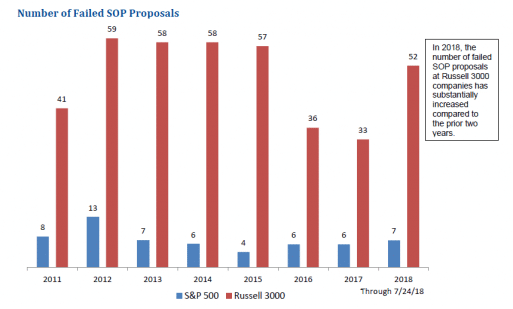 So far this proxy season, only eight Russell 3000 companies have submitted management proposals on proxy access to shareholders. Not surprisingly, among companies that have reported their vote results, seven of eight management proposals received majority shareholder support. Shareholder proposals on key governance and pay-related matters continue to draw significant attention from corporate boards. 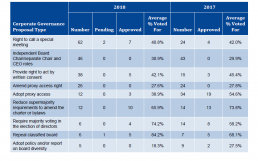 The chart below provides a comparative summary of 2017 and 2018 shareholder proposals on key corporate governance matters. The chart below provides a comparative summary of 2017 and 2018 shareholder proposals on executive pay matters. Note: Each of the approved shareholder proposals is only advisory and non-binding on management. To protect the confidential and proprietary information included in this material, it may not be disclosed or provided to any third parties without the approval of Meridian Compensation Partners, LLC. © 2018 Meridian Compensation Partners, LLC. The material in this publication may not be reproduced or distributed in whole or in part without the written consent of Meridian Compensation Partners, LLC. Questions or comments regarding this report should be directed to Donald Kalfen at dkalfen@meridiancp.com or 847-235-3605.